I was thinking about continuing the series and I did that quite frequently lately, but I don't' think there's a point in doing that anymore. However, I had to at least finish the volume so 140 will be my last Terra Formars chapter 'side from my magazine releases compiled into volumes which I'll be doing in the coming weeks. That said, I'm not too upset about the fact that Imperial has picked up the series. For one, they'll actually be catching up to the raws which is something to look forward to. 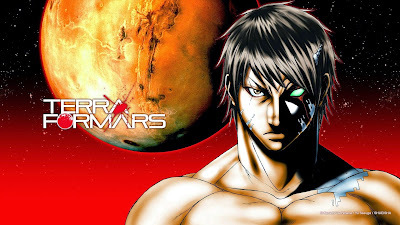 And second, it was pressing for me to work on a Terra Formars chapter every week since there was a deadline of sorts that I had to commit to, and the fact that I was doing it all on my own for the most part. So, stopping work on the series will in turn take a lot of that pressure off my back, and give me time and effort that I can spend elsewhere. I.E. Kyochuu Rettou. Anyway, for the record, I don't hold any ill feelings toward Imperial about this. Yeah, I don't like what happened, but that doesn't mean I hate them. That aside, I do not like the way they're handling the series. They got a few things wrong in 140, and lord knows if they made mistakes like that in 141, and future chapters that they will translate. Though, I guess you could say that they might fix them in the future or it's because they're doing them so fast, but I'm still a tad bit pessimistic about it all. Meh. Now that I got that out of the way, I'm unsure but I might start translating Rain Hard. Again, unsure, but it is a possibility. What do you guys think? All said and done, I just want to thank all of you guys who have been following me thus far. I really appreciate the comments that I've been getting, so it meant a lot to me. Thank you all, and I'll be seeing you again elsewhere in another series. Bye! Actually, I forgot to cover the other language groups. Okay, the main Spanish group Ouroboros, or their leader just said, "okay". Yeah, an appropriate response for us working together for many months on end this entire year, right? Meh. The second Spanish group (Fansub YamiDrk) who directly translates mine into Spanish was very sad since he thinks mine to be a better quality and more reliable translation than Imperial's. And lastly, the Brazilian group (O Nekomata) said that they understand, and that they thank me for all the help that I gave them, and that they are very grateful. Anyway, I recommended to the second Spanish group and to the Brazilian group that if they're interested in continuing to contact Imperial and see if they'll allow them to work together. If they did or not, and if Imperial has or will let them, well, that's not really any of my business. Dont worry you can always pick it up. Thanks for doing this for a long time. What do you think about manhwa Jack Frost. Its from South Korea but with your connection you can probably get it on Japanese. Am sure that it would be 100% with this series. Its similar to Hellsing. I waited for years to be translated . Yeah, though they'll probably keep at it. Anyway, sorry, but I'm not exactly taking requests at the moment. Where did you get that idea? I'm going to focus on Kyochuu Rettou and get the second chapter done, and then I'll start work on Rain Hard immediately after. That's my plan for the most part. Sad day indeed, i liked your translation a lot, well lets hope Imperial Scans improve, but having 2 groups or more in a series is never a bad thing imo, one can take a break and pick it up later if the other one drops and so on, we all know how this works, groups come and go all the time. I guess the one question I have to ask is will you keep reading alongside and by any chance see you in the 4chan posts of latest releases? Yeah, I've been posting in the Terra Formars threads on 4chan since last December and will continue to be... as I always have been... anon. Thank you very much for your hard work, I began following from randomly online manga to your home here. Always with a good quality with backup and detail information. Yup. I still plan to do 'em. Just wanted to get a few things out of the way first. Anyhow, I'll probably do the most recent volume first.